Your pathway to perfect extensions starts with a pre-extension hair health diagnosis. 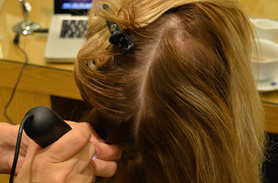 Before application, our digital microscope scans your hair & scalp to assess the condition & suitability for extensions. We can look to prescribe any treatments to get your own hair & scalp in the best condition so you can make the most of your extensions. We will repeat this analysis once your extensions have been removed to see the difference in your hair & scalp and reassure you that no damage has been caused from wearing the extensions.